Situated close to a wealth of amenities and transport links, this lovely one bedroom flat boasts light and spacious living space and a generous sized bedroom. Sinclair Gardens is situated moments from the amenities of Shepherd's Bush and within easy reach of the shops, bars and restaurants of Notting Hill Gate. Frequented by celebrities, this out-of-the-way hotel has an amazing spa and a glam rock inspired afternoon tea too! 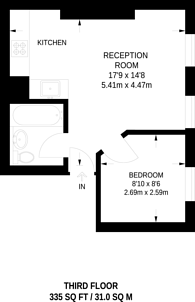 331 (30 Sq M) approx.